New at Aldi’s are these Sweetened(also available in Unsweetened) UHT Almond Milk cartons that are plant based, Lactose Free and have added Vitamins B,B12 & D added to it. Straight away you can taste the nuttiness, almond like but nutty in flavour. I like it better than the Alpro version which is thicker and has a different sometimes too much creaminess, this one is thinner, lighter and more nutty flavour and much cheaper. Its sweet enough to drink on its own and pleasant enough to enjoy with other things. I wouldnt use it on Corn Flakes or Rice or anything like that but on Muesli and Oats it goes well. 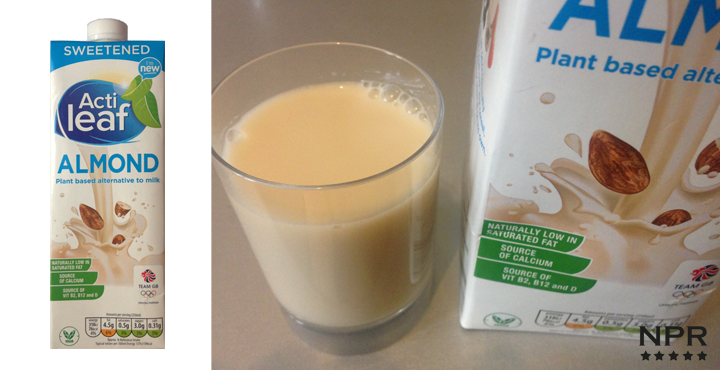 Overall a really nice tasting product and a back to basics Almond Milk drink more natural in flavour than Alpro. Aldis coconut milk clearly has caragreen in the ingredients. The almond milk does not. So I would assume it doesn’t have it. Is it manufactured in a gluten free environment and safe for coeliacs? hi. I bought almond milk free m Aldi yesterday when I opened the container what was inside was highly disturbing.. my daughter is just after drinking that milk which was in this container.. the date on this is 2018 so how do you expect it to last the long if it’s like this now.. it was just opened so don’t tell me you have to use within 3 days of opening. The editor ‘s review is very poor in my view. I have used this product quite a bit but only because it’s cheap! I find the flavour very unpleasant, not really like a food product at all . Nutty taste? That’s a joke ! It has tones of compost. I would almost prefer to swallow a tablespoon of Spirulina straight ! I would like to know where the almonds are sourced from, please. Thank you.